Technical and vocational education and training (TVET) has the potential to promote the productive participation of women in the labour market, equipping them with the necessary skills to undertake the jobs of the future. However, this potential remains largely unfulfilled in certain occupational sectors, particularly those requiring training in science, technology, engineering and mathematics (STEM). In the majority of developing countries, women are much less likely than men to enrol in TVET, with even lower enrolment numbers in STEM fields. 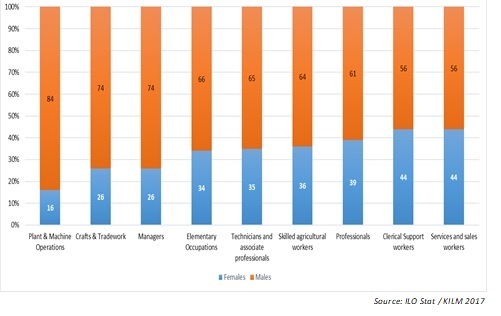 Female participation in some of the key occupational TVET groups, remains lower than male. The UNESCO-UNEVOC International Centre is giving particular attention to this issue as it aligns with UNESCO’s Strategy for TVET (2016-2021) and its Priority Gender Equality Action Plan, as well as UNESCO-UNEVOC’s Medium-Term Strategy II. Consequently, on March 21st–22nd, UNESCO-UNEVOC hosted an experts’ workshop in Bonn, Germany on Gender equality in STEM-related fields in TVET. The workshop sought to better understand the root causes of gender disparities in STEM-related TVET through discussions with experts from ten UNEVOC Centres across the globe, namely Ghana, Chile, the Netherlands, Australia, Germany, Costa Rica, Philippines, Jamaica, Lebanon, and South Africa. 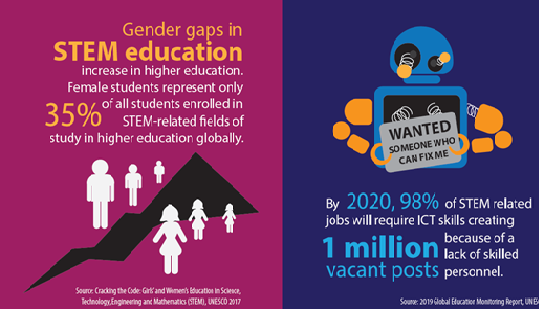 Gender inequalities in access to STEM related fields in TVET can affect the access to and participation of women in specific occupational areas, while the low female representation in those STEM-related occupations in turn affects the choice of fields in TVET by girls and parents, as well as the learning environment. The workshop experts addressed the key factors that are contributing to inequality in STEM-related TVET, such as inadequate policy frameworks, societal attitudes, the nature of STEM in the classroom and workplace, and how they affect the mindset of girls and women to pursue education and training in STEM subjects. Through the sharing of insights and interactive sessions on the underlying causes of gender inequality in STEM, the experts were able to better understand what research is needed and how to address the current challenges related to gaps in indicators and data collection. The workshop served as the basis of an upcoming study to improve the understanding of issues related to gender equality in STEM in TVET and present global perspectives of the measures that have been taken to promote gender equality in the respective fields. UNESCO has previously conducted a study on STEM education and gender equality, but there exists a knowledge gap in this field in the TVET sector. The UNESCO-UNEVOC study is expected to contribute to strengthening an evidence-based approach to promotion of gender equality in STEM-related TVET.